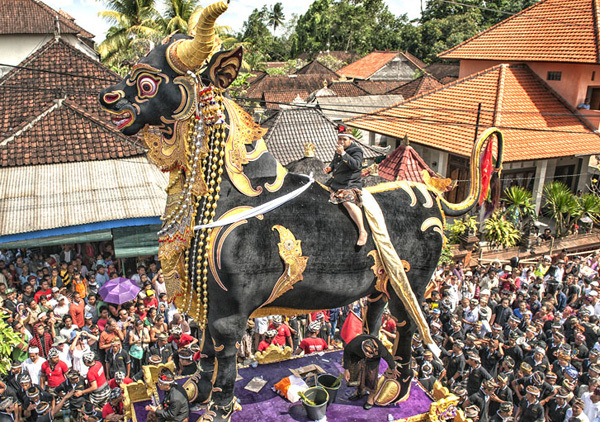 Ngaben is one of the Balinese important ceremonies. Ngaben for Balinese is a sacred and important ceremony because by doing ngaben the family of the deceased could free his/her soul from worldly ties. By this ceremony the family hopes that their relative will go to heaven and could reincarnate as a better person or even moksha (united with God). 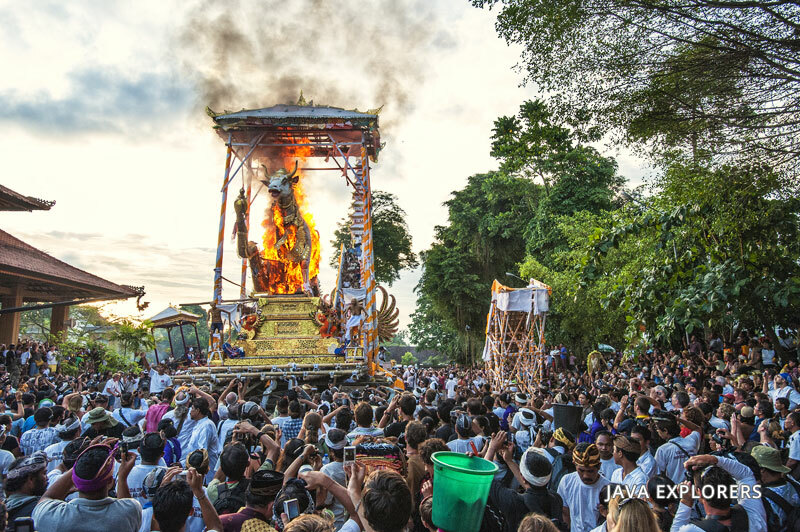 This is a funeral ritual performed in Bali to send the deceased to the next life. The body of the deceased will be placed as if sleeping, and the family will continue to treat the deceased as sleeping. No tears are shed, because the deceased is only temporarily absent and will reincarnate or find final rest in Moksha (freeing from the reincarnation and death cycle). Ngaben is not always immediately performed. For members of the elite castes, it is normal to perform the ritual individually for the deceased within three days. The ceremony could be done as fast as possible. 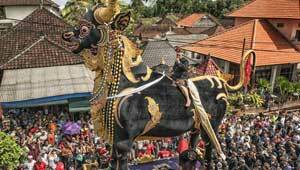 However, they still need to wait for the best day according to Balinese calendar, family agreement, and permission from Pedanda (Hindu priest). Until the determined day, the body will be kept at home. A good day is usually chosen by the priest after consulting and choosing the best day from the Balinese calendar. Preparation is usually made in advance, even before the best day is chosen. 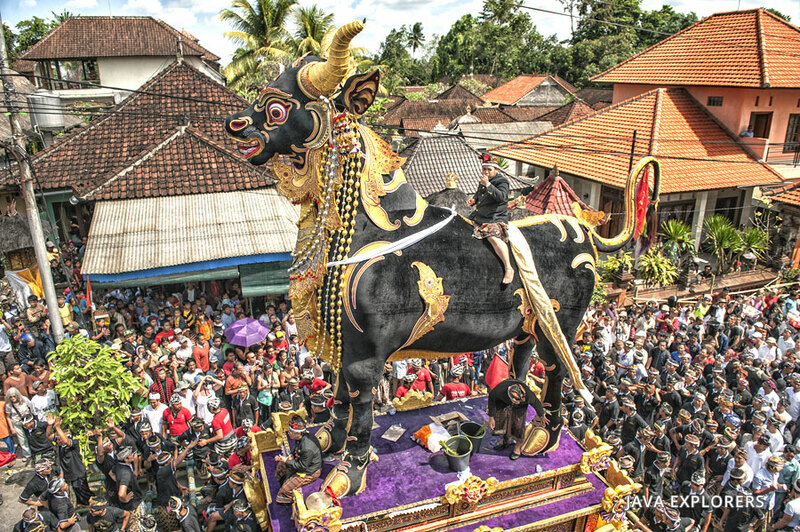 During this time, the family will make bade and lembu which are the main equipments for the procession of ngaben. Bade and lembu are created by a team led by an undagi or Balinese traditional architect. Bade is a kind of great tower with multi tier roofs decorated with colorful carved papers, woods, and bamboos which is used as a carrier of the body until it arrives in the graveyard. Meanwhile, lembu is a container of the body while it is incinerated. Lembu means ox, as its name implies, this container is in the form of an ox. 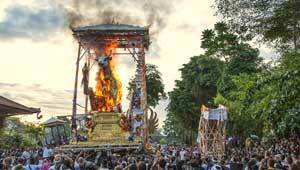 Arriving in the graveyard, the body is placed into the back of lembu which is believed as the transporter to nirvana. The procession is initiated by a pedanda or priest. When the body is burnt with the lembu, all of the family members will gather around the burnt lembu. After all is completely burnt to ash, this ash is washed away into the sea or river. For the Balinese Hindu, sea is the symbol of the God's place gate. Besides that, throwing the ash of the deceased to the sea also means returning the five elements of human body (water, heat, wind, earth, and ether) back to the universe.